Early results from Indonesia's first direct presidential election suggest incumbent Megawati Sukarnoputri is set to lose office. Retired army general Susilo Bambang Yudhoyono looked on course to win, after a peaceful and orderly election. With nearly 16m of the more than 150m eligible votes counted, Mr Yudhoyono had 59% compared to Mrs Megawati's 41%. Results are set to trickle in over the coming days, although the winner will not officially be known until October. But a projection poll conducted by the Washington-based National Democratic Institute suggested Mr Yudhoyono would end up even further ahead, winning 62% compared to Mrs Megawati's 38%. Mr Yudhoyono, also known by his initials SBY, won the first round of voting in July and has led opinion polls ever since. "I do believe, God willing, that I can win this election," he said as he cast his vote near the capital, Jakarta. The BBC's Rachel Harvey in Jakarta says most Indonesians seem to be in the mood for a change, especially since President Megawati has increasingly been seen as reticent and ineffective. 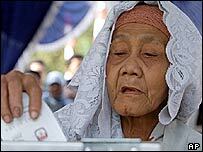 One voter, Siti Komariah, told the Associated Press: "I voted for SBY because I think he is smart and good looking. I want the country to be safer, I want prices to be lower". Voting appears to have passed off peacefully across the vast country. Security fears had increased in the wake of a bomb attack on the Australian embassy in Jakarta on 9 September, which killed nine people. Monday's elections are the final stage of a democratic process that began with a parliamentary poll in April, and continued with the first round of the presidential contest in July. The July poll narrowed down the field from five candidates to two - Ms Megawati and her former security minister, Mr Yudhoyono. Whoever wins, Indonesia's next president will for the first time have a direct public mandate. For that reason if for no other, this election marks a significant moment in Indonesia's transition to full democracy, our correspondent says. There appears to be little difference between the two candidates in terms of policy. Both are promising to boost Indonesia's under-performing economy and root out endemic corruption. They also agree on taking a tough line towards separatist movements in Aceh and Papua. Both say they will also do all they can to hunt down the militant network which has carried out a series of major bomb attacks in the past two years - in a Bali nightspot, Jakarta's Marriott Hotel and most recently at the Australian embassy. This contest has been as much about personality as anything else, our correspondent says. Ms Megawati, often seen as aloof by her critics, has been spending time meeting the public and giving media interviews in an effort to gain ground on her opponent. But she displayed her usual reticence when she voted on Monday, arriving later than scheduled. Mr Yudhoyono, meanwhile, has promised "effective leadership". He has drawn strength from his image as a man of integrity, as well as a determined leader in times of crisis. As security minister, he led the hunt for the perpetrators of the Bali and Jakarta hotel bombings. "Indonesia... is putting its faith in democracy"
Image the key for former general Susilo Bambang Yudhoyono.